Will the finished presentation will be consistent with our goals and objectives? Yes. The first step towards creation of your customized presentation is providing you with a Presentation Outline Guide. You’ll respond to questions about your objectives, your products and your audience. The P.O.G. is a multi-page questionnaire that when completed by you and your associates will provide your key message points in a prioritized format. Charles will then use your answers to create a fully customized presentation. To ensure that the finished script meets your expectations, you’ll receive a script draft for approval. How much time is required to create a script with our message? Once the completed P.O.G is received with your product information, a script can generally be prepared within one week. Remember, the script draft would then be sent back to you for approval. Revisions are made to the draft as requested. From start to finish, the entire process takes about 2 weeks to provide you with a final script. What results can we expect at trade shows? 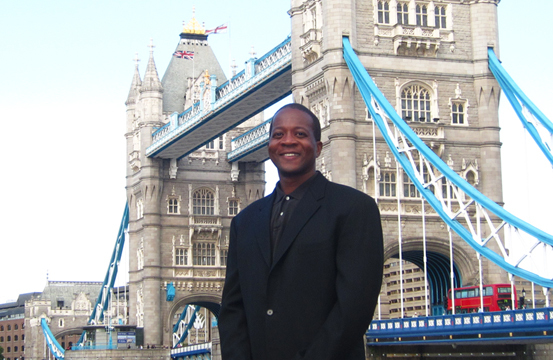 Some clients have doubled and tripled their leads when Charles has been involved with their exhibit program. There are many factors that influence attendee traffic on the trade show floor. However, with Charles in your exhibit, you’ll have an attraction that delivers your message in a unique manner throughout the exhibit day. Along with providing you with a custom scripted presentation, we’ll also work with your exhibit staff to show them how to use the presentation to their advantage. The bottom line is that our custom scripted magic entices attendees stop at your exhibit, listen to your message, and get involved with your exhibit program. Can Charles be involved with our meetings? At all meetings audience attention levels start to decline right after the opening speaker. However, by adding magic to your meeting agenda you’ll keep attention levels high and ensure that your message will be heard. Imagine the attention you’ll captivate when your CEO appears out of thin air. Magical illusions large and small are available options. 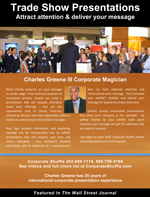 And, as with the trade show magic, the meeting magic is always customized and tied to your program. How do you charge for your presentations? All of our presentation are done on a project by project basis. For trade shows there is a performance/production fee plus standard travel expenses. The performance/production fee includes not only the performance at the trade show, but also all pre-conference scripting and production work. For an exact quote you’ll need to contact Charles and Corporate Shuffle to discuss your presentation dates and requirements. We’ll then send you a detailed proposal that will fully outline your investment options. What companies have used your presentations? Charles has been trusted to deliver the marketing messages of a diverse group of clients that includes Alcon, Exxon, Frito-Lay, Insulet, Johnson & Johnson, Kodak, Ortho Pharmaceutical and Texaco. Whatever the product or message, Charles can tailor his magic to appeal to your target audience. For more than twenty five years Charles has worked exclusively as a corporate magician. In that time he’s done corporate presentations at meetings and trade shows around the globe. His business travels have taken all over North America and to 13 other countries that include China, Egypt, France, Germany, Mexico, Monaco, Sweden and Switzerland.